One of the first things a newcomer to Saigon notices is the numbers of motorbikes on the roads. Some estimates put the number of motorbikes at 5 million - I believe it could actually be more than that! 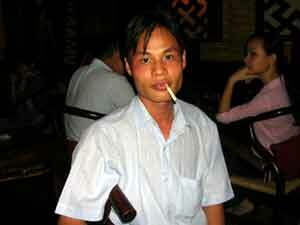 Thuan came and met me at my hotel and suggested we go to a place where he often goes with his friends. This meant I had to get on the back of his bike and travel through the streets of Saigon the way most locals do. It was great fun. 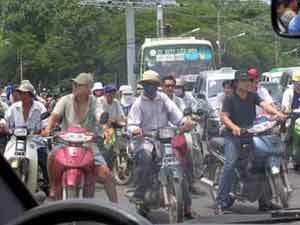 Most Saigon motorbike riders are actually very good drivers. They take amazing risks, but mostly at quite slow speeds. Motor cyclists weave through moving waves of motorbikes to get through intersections. It looks like controlled chaos, but in two weeks in Vietnam I did not see one accident. I saw many incidents where bikes and cars went within one centimetre of each other but they never actually collide - amazing. We arrived at the cafe (called Nirvana - a stylish, elegant restaurant and bar set in a pleasant garden and restored villa) and talked for a couple of hours about our lives and plans. Thuan is an engineer who enjoys his job. He gets to travel around Vietnam in his job quite frequently, and he enjoys this. 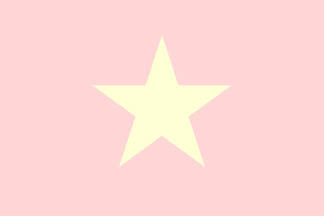 He has a brother and sister living in Paris and intends to go there in September 2006 to continue his studies. After a very enjoyable chat we left the cafe, and asked the parking attendant outside (who looks after the bikes while people are in the cafe) to take a photograph of us, then Thuan drove me back to my hotel. 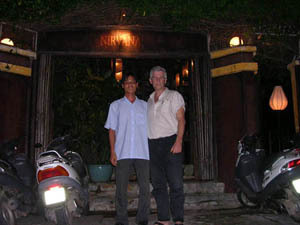 It was great to meet a new Webhead, and I hope Thuan and I meet again one day - in Vietnam, Paris, Australia......time will tell! Thanks for a lovely evening Thuan. It was great to meet you.